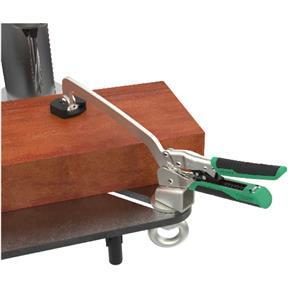 Drill Press/Bench Clamps feature technology that enables the jaws to automatically adjust to and grip different size objects quickly without manually fine tuning the adjustment. 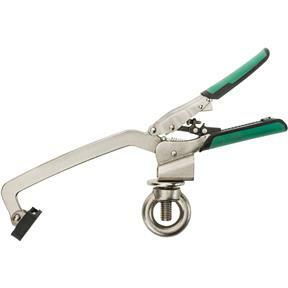 Set the desired clamping pressure, and the jaws apply that pressure to the different sizes of material - no continuous adjustment needed for unprecedented convenience! Dual application with mounts for Workbench T-Track and for Drill Press/Table machines, this clamp fits all your needs. 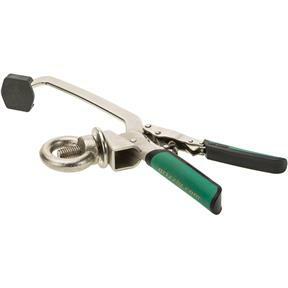 Comfortable Soft Grip and removable rubber tip for soft materials round out the features. 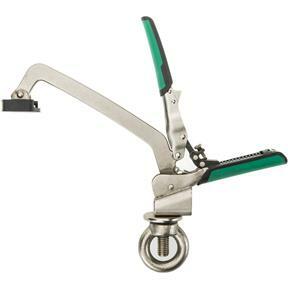 One-hand clamping operation frees up your other hand to hold material for fast easy setup. Jaw range 4.5", clamping force 25-250 lb. I purchased this "drill press" clamp for its other purpose, to use as a t-track table clamp. The conversion is easy (and reversible); the threaded rod is removed and replaced with a supplied screw. The head of the screw serves to retain the clamp in the t-track. 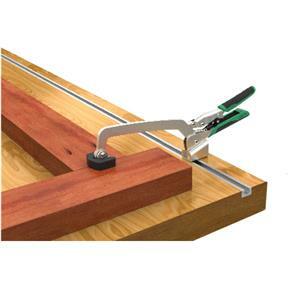 The clamp (with screw) can also be used on a dog bench using Kregtool's bench clamp base. Once I got the hang of adjusting the tension I have found the clamps to hold securely flat work pieces as well as dowels if teamed with a fence. I now have several.